One of the keys to profitability with established products is improving the efficiency of core processes. This may mean either increasing productivity or reducing costs, or both of these. For this reason, one of the classic tasks for an idea production and evaluation consultancy like Zephram is to help clients identify such opportunities. 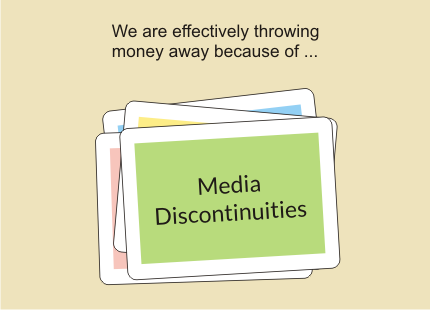 One tool which we like to use for developing cost reduction ideas is a set of flashcards, each of which names a potential source of process inefficiency. There are thirty flashcards in total, derived from different knowledge sources including both our own experience and standard approaches such as the lean production movement. One of the problems we regularly face in innovation projects is our clients‘ resistance to their own best ideas. We have already quoted a number of sources in this blog, including the Italian Renaissance philosopher Machiavelli, the American journalist Jessica Livingston and the British Science Fiction author Arthur C. Clarke. Automobiles traveling on country roads at night must send up a rocket every mile, then wait ten minutes for the road to clear. The driver may then proceed, with caution, blowing his horn and shooting off Roman candles, as before. as well as the various overlaps between them. Shared must-haves. Not implementing these features would place a supplier at a serious disadvantage, since customers will view them as necessary. Our stupidity. These are the product features a company is planning to implement which are of no interest to the customer and the competition has (quite sensibly) not implemented. These are simply wasteful and should be removed from the task list. Shared stupidity. 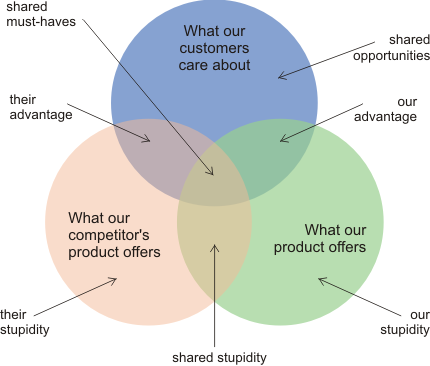 These are features of both the company’s and the competition’s products which the customer is not interested in. These should also be removed from consideration. Discovery-driven innovation processes such as Lean Startup and Hypothesis-Driven Entrepreneurship are currently very much en vogue. They aim to solve the problem of reducing the uncertainty involved in developing successful new-to-the-world offers. In order to better understand the importance of discovery-driven innovation and how it compares to other types, we have developed the matrix shown above. The matrix distinguishes between the innovation goal and the route needed to achieve that goal, each of which can be either known or unknown. 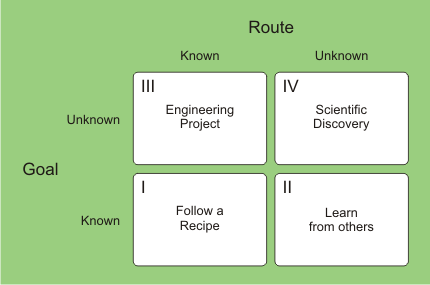 The resulting 2×2 structure yields four quadrants, each of which represents a different type of innovation project.